The Padepokan is no longer available for silat training. The following information is included for historical purposes only. For so long my fathers' dream was to build a school so the students didn't have to practice outside or in the living room where we lived. As you know, Pencak Silat is traditionally family oriented and would normally be taught to someone inside the family or neighbors that befriended the family. Practice might be done in the ricefields or under a Bamboo tree where there was some shade and the sun could not directly touch the body while we were practicing. For so long, my family in Bandung, Indonesia taught in the living room. And of course, we only teach a few students at a time due to lack of space. My fathers' dream continued as just a dream even up until he passed away. Since then I have carried his dream and had to put it on hold as it seemed impossible to accomplish. Meanwhile, little by little I had continued to spread the art to the world, traveling around the US and Europe. I had the idea to bring many groups of westerners to Indonesia to experience a special program that I put together, a Silat camp in Bandung, Indonesia. This way I could do more to educate westerners about our culture, not just with words or talking but by using action and their own experience, with me as their guide for them to be able to see for themselves what Pencak Silat is. ATTENTION: THERE ARE SOME FORMER INSTRUCTORS OF MINE WHO CLAIM TO HAVE HAD FORMAL TRAINING UNDER MY FATHER'S GUIDANCE. THIS IS NOT TRUE, ALTHOUGH, I HAVE BROUGHT SOME OF MY STUDENTS TO MEET HIM DURING A BRIEF VISIT, HIS SHARING ONE OR TWO TECHNIQUES DOES NOT CONSTITUTE FORMAL TRAINING OR ANY TITLE EARNED ON THEIR BEHALF. If they are studying Pencak SIlat from me or any other West Java style teacher, it is important that they know about Sundanese culture in particular, and Indonesia culture in general, through their own experience. In my opinion, this goes for anyone learning any art from outside their own country and culture. They should travel to where the art came from and learn more about the people and culture behind it. These students will find that things are as I have reported them to be and instead of relying on my words they can see for themselves. I'm not afraid to take them, because I have nothing to hide. I'm happy that they can take this opportunity to learn more. I feel it is important for them to know more because I feel that I'm an ambassador of Pencak Silat and the Sundanese culture. It is my duty to share this information. Many people have taken me up on my offer and have come to Indonesia. They have met many Pendekars, have gone to Cimande, and so far I'm the only person that I know of providing such opportunities to share the culture. But still I was not happy that we didn't have a place to practice in my area. My father's school is still around but it is too small for more than 5 people. (This was in the living room of our house) I kept his dream and penny by penny, I have been saving money planning someday that I would fulfill this dream of my fathers'. And then one day thanks to one of my older students in the U.S.A., Steve Hunting, who has always listened to my dreams and never failed to be there to give me advice, with his donation and his help to get a loan I was able to start to build our official school in Indonesia. We named the school the SUWANDA ACADEMY and believe it or not, my father's dream has materialized. This Academy is now the International center for Mande Muda training. Now we hold regular training & the Indonesian two week training camps there. For 2 weeks at a time, day and night we are kicking, punching, choking, traveling, seeing performances, performing, meeting teachers, until everyone is exhausted and I have to say "enough for today". On the top of that the student will learn and see more culture and get to understand what I have been telling them about the hospility of the Sunda people and the richness and beauty of the performing arts. My goal is that all the participants that come to the Silat camp will understand more about Pencak Silat, culture, the beliefs behind it and when they return to their homes they will understand more deeply about Mande Muda and Pencak Silat in general. 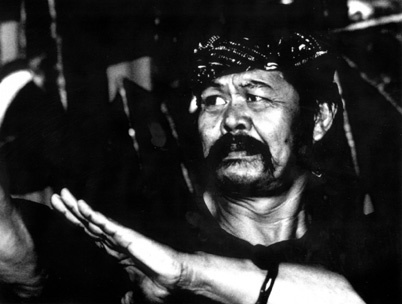 So when someone tells them a story or information about Pencak Silat those people can use their own experience to gauge the information by and if they know what they hear not to be true they can smile. They won't have to argue because they don't have to prove anything, they have been to that culture in Indonesia and have experienced it firsthand and understand it better and will know fact from fiction. At the present time the Suwanda Academy is being used by the local schools that don't have enough space for all their students, as well as by our instructors who are teaching their students and many children that we have adopted (basically we have taken responsibility for 20 childrens' educational needs, from tuition, school clothes to their transportation fees and more. In return, the children have agreed to learn Pencak Silat and we hope that one day they will take responsibility in the school and teach other and help to run the school and continuing spreading the art preserving the traditional aspects that make it uniquely from our culture). The goal for this facility is to provide the place and means for sharing and spreading the arts and culture of the Sunda people. We hope for it to be there for many generations to come. We also lend the school to the local artist who teach and practice local music and performing arts, teaching and practicing Silat drums and instruments, and for all the Pendekars around West Java to gather and discuss Pencak Silat. Talking all day and into the late evenings until they want to retire to one of the rooms where they can sleep and rest up for another day of continued deep discussions about important issues about Pencak Silat like the movements, terminology and more. Whenever we are in Indonesia it is important that this type of activity takes place to ensure the continuance and growth of Pencak Silat and we are happy that the Pendekars take advantage of this facility for this type of use.. If you are interested in coming to the 2 week Silat camp you can e-mail or call us and we will send you an application that you can fill out and return to us. Space is limited so let us know as soon as you decide you would like to join us. We will let you know if we can accomodate you at that time.